174 pages | 17 B/W Illus. Museum Innovation and Social Entrepreneurship makes a contribution towards building a museum perspective of innovation that takes into consideration the unique role of museums in society. Beginning and ending with the idea of museum innovation in a wider sense, the book takes digital innovation as a particular focus. 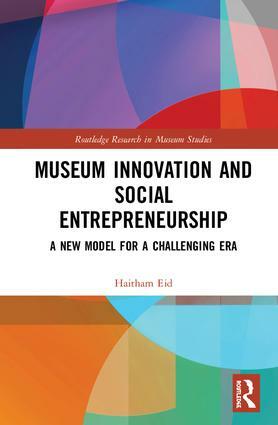 Drawing on innovation theories from business studies and case studies from national museums in the US and the UK, as well as numerous examples of innovative museum projects around the globe, the author unpacks, in practical terms, what it means for museums to be innovative and socially enterprising. As a result, Eid presents a research-based model of innovation in museums, which is flexible enough to be fully or partially adopted by any museum, regardless of size, location, mission or nature of the collections it houses. As such, this model makes innovation in museums scalable, replicable and feasible to start and operate. Supplying the museum studies field with essential terminologies and conceptual frameworks related to innovation, Museum Innovation and Social Entrepreneurship helps to forge new ideas and create common ground with other disciplines. Therefore, the book should be essential reading for academics, researchers and graduate students working in the fields of museum and heritage studies, digital humanities and business studies. It should also be of great interest to practitioners working in museums around the globe. Haitham Eid is Associate Professor and Director of the Master of Arts in Museum Studies Program, Southern University at New Orleans, USA. He earned his PhD in Museum Studies from the University of Leicester, UK.